The successful landing of the Phoenix probe means that Earth has finally tied the score with Mars in the interplanetary Expensive Hardware Lob contest. See the scorecard for details. The Phoenix lander is set to touch down on Mars today at 7:52 p.m. EDT. You can check out the mission home page, or the NASA/JPL mission page, which links to a bunch of other stuff. Let's all hope the Great Galactic Ghoul doesn't bag another Mars probe. UPDATE: Success! Phoenix is down in one piece and transmitting data. Congratulations to all the people who made it happen. The blue-stained roundworm on the right is the reason the veterinarian wants you to give your dog a heartworm pill each and every month. It's Dirofilaria immitis, a filarial worm that likes to take up residence in the heart and pulmonary arteries of canids. At least, adults like to live in the heart. Their babies prefer to ride the bloodstream, moving to the tiny vessels under the skin each night in the hopes of getting a ride from a hungry mosquito. After a couple of molts in the mosquito's body, they migrate to its salivary glands and wait for the insect to find them a new host. It's not a flying car, it's even cooler: a pulse-jet bicycle! Don't try this at home, nor anywhere near my home. And a tip of the buzz-bomb hat to David Szondy's Ephemeral Isle Web log. Here's a fascinating talk on how mushrooms and other fungi can Save The World. It's from the always-interesting TED series. This particular talk is by mycologist Paul Stamets, who is enthusiastic about fungi to the point of occasionally sounding like the villain in a horror movie. Tomorrow, May 17, marks the anniversary of the discovery of the Antikythera Mechanism in 1901. The Greek archaeologist Valerios Stais noticed a bronze gear embedded in a chunk of rock recovered from a Roman-era shipwreck near the island of Antikythera. It proved to be part of an incredibly advanced piece of clockwork machinery, the sort of thing Europe did not produce again until the Renaissance. Nobody was quite sure what the thing was supposed to do until the 1950s, when British historian Derek deSolla Price proposed that it was an astronomical computer. Since then, the Antikythera Mechanism Research Project has been steadily working to uncover the device's secrets. You can even download an emulator which mimics how scientists believe the Mechanism worked. I'm more interested in what the Antikythera Mechanism reveals about scientific and technological progress. To wit, it isn't inevitable. In 100 B.C. the Greek technicians of Rhodes could build a portable analog computer capable of tracking the Moon and planets. It rivaled Renaissance era clockwork. So why didn't every Roman city have a clock in the forum? Why didn't Roman bureaucrats use mechanical calculators to keep track of tribute? Why didn't anyone use this cool stuff? The short answer is that they didn't want it badly enough. Technology isn't just a matter of what a society knows how to do, or can afford to do. It's also a matter of what the society wants to do. The Romans and Greeks could make mechanical devices, they just chose to do other stuff -- and thereby missed out on the advantages which mechanization could provide. Oh, and it appears that NASA is disposing of the tooling and equipment used to build the Space Shuttle orbiters. Not that I'm trying to draw any analogies here, you understand . . .
From the redoubtable Pink Tentacle web log comes word of a message beamed into space by Japanese astronomers in 1983. It's instructive to compare it with the more well-known (to me, anyway) message transmitted from Arecibo in 1974. The Arecibo message is certainly more stodgy. It has crude pixel-pictures of a human figure, the giant Arecibo antenna, DNA strands, atoms, and the Solar System. The Japanese one boasts a buxom female figure, the formula for ethanol, and a cheerful kanji toast. I suspect neither one would make much sense to an alien civilization. You just can't convey much useful information in what amounts to a bathroom-tile mosaic. The chief datum carried by both signals is simply, "We're here!" Will we get a reply to either one? Don't hold your breath. The Japanese message was sent toward Altair, which is a nice enough star if you like 'em bright and short-lived. To date nobody has even located any planets circling Altair, let alone anything capable of detecting a radio broadcast. Conversely, the Arecibo message was transmitted toward a star cluster 25,000 light-years away. Even if there is someone listening, it will be 50,000 years before we get an answer. This doesn't mean we should quit looking. Contact with another intelligent species is so important it's worth the wait. And probably the most amusing topic to discuss at first will be their reaction to our weird little drawings beamed into space. I propose that we nominate a carbon nanotube as the Presidential candidate for one or both American political parties. They're abundantly qualified. They're slim (1 nanometer in diameter), they have integrity (300 times stronger than steel). They can heal the sick, walk on water, and have no problem with authenticity. Best of all, they can apply scientific precision to a perennial issue of political campaigning: the indigestion tour of eateries in key districts. Who's got the hottest hot sauce? Nanotubes can tell us. Back in September I wrote about the life history of pentastomids – a group of animals also known as tongue worms – and touched briefly on some of the problems that can crop up when members of the genus Linguatula accidentally infect humans. Humans are not usually a host for these animals (they're typically found in the lungs and nasal cavities of carnivorous vertebrates), but accidents happen. And where Lingulata tends to stay inside the nasal passageways, there's another group of tongue worms that gets around more. 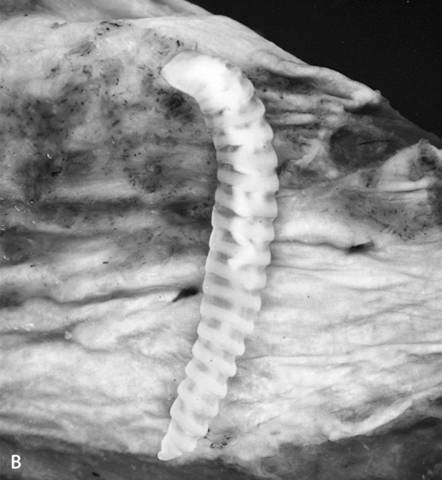 Larval worms of the genus Armillifer, like the one pictured here, migrate much further afield, encysting themselves into the liver, abdominal wall, and (as pictured here) the diaphragm. from D.H. Connor and F.W. Chandler (eds) 1997. Pathology of Infectious Diseases. Appleton & Lange: Stanford, Conn.